Moth Fly also called "drain flies" sink flies and sewer gnats , there are more than 4500 species of clogmia albipunctata globally . 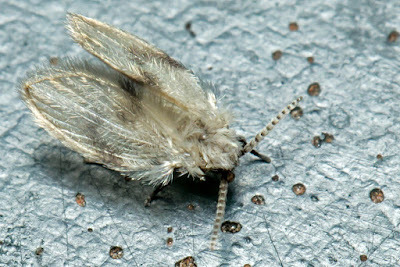 Their short hairly bodies and wings gives them a furry moth -like appearance and have earned them the name moth flies. Although they come from drains, they are not harmful because they do not transmit human diseases albeit their presence can become quite an annoyance .